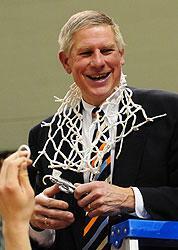 HOLLAND – Longtime Hope College men’s basketball coach Glenn Van Wieren has announced his retirement. Coach of the Flying Dutchmen for 33 seasons, Van Wieren, 68, ends an association with Hope College basketball that spans 50 years dating back to his playing days in the early 1960s. “This is the end of an exceptional era in Hope men’s basketball! A giant in the history of Hope sports is retiring,” said Hope College President Dr. James E. Bultman. “For 33 years Glenn Van Wieren’s varsity basketball teams have performed at the very highest levels. Twice national coach of the year, he is among the all-time winningest coaches in the history of Division III. His record speaks for itself. “I will miss Glenn both personally and professionally. This is a friendship in intercollegiate sport at Hope that goes back exactly half a century. I admire him. “I would like to thank the administration, colleagues, students, players, and parents who have been so kind, faithful, and supportive of me over the years,” Van Wieren said. “My life was changed and enriched during my Hope student years by coaches Russ De Vette, Lawrence “Doc” Green, Gordon Brewer and Daryl Siedentop. They established a model for me and provided the impetus to pursue my dream to be a professor and coach at my alma mater. Van Wieren nurtured a basketball program that is highly regarded across all of NCAA Division III. Averaging exactly 20 victories a season over 33 years (660-219), he had just one losing season. The 2009-10 Flying Dutchmen posted a 21-8 record to mark a school-record 31st consecutive winning season. Van Wieren entered the 2009-10 season ranked the fifth winningest coach in NCAA Division III history, both in victories (now 660) and winning percentage (now .751). He guided the Flying Dutchmen to a record 17 Michigan Intercollegiate Athletic Association (MIAA) championships and appearances in 21 NCAA Division III post-season tournaments, including this past season. His teams advanced to the NCAA Sweet Sixteen six times, to the Elite Eight four times and the final four three times, most recently in 2008. Hope finished second in the nation twice (1996 and 1998) and was third in 2008. Van Wieren recorded his 600th victory faster than any Division III coach in history. He coached two teams (1983-84 and 1994-95) through unbeaten regular seasons. He coached in 87 “Rivalry” games against Calvin College, posting a 46-41 record. In 2006 he was honored by the Grand Rapids Sports Hall of Fame with the organization’s Lifetime Achievement Award. He was inducted into the Hall of Fame of the Basketball Coaches Association of Michigan in 2003. He stands as one of the outstanding athletes in the history of Hope College. A 1964 graduate, he earned 11 letters in the sports of basketball, baseball and cross country. While at Hope, he also coached baseball, cross country and soccer. He is among the winningest coaches in MIAA history with a total of 19 league championships in basketball (17), baseball (1) and soccer (1). His wife Jacquelyn (Jackie Nyboer) is a 1967 Hope graduate. The Van Wieren have four daughters, Gretel, Heidi, Kuria and Rebekah, and seven grandchildren. Hope College Theatre will present "The Pinter Project," a collection of short plays written by Harold Pinter, in the DeWittCenter studio theatre beginning Friday, April 23. Hope College has been chosen to host the NCAA Division III Great Lakes Regional cross country meet for men and women on Saturday, Nov. 13, 2010.